I loved Poptropica Forgotten Islands on the iPad, iPhone, and iPod Touch. It was so much fun, and it has received updates. Ubisoft has now ported Poptropica Forgotten Islands over to the Nintendo 3DS, and give us 3D. Unless you play it on the Nintendo 2DS. There is no 3D allowed on that hand held. We perform a variety of fetch quests in Poptropica Forgotten Islands. People need us to go get them a certain object. Run around the level until you find it. We can also purchase a wide array of clothing with the coins we find in the levels. Collecting money is very easy in Poptropica Forgotten Islands. Poptropica Forgotten Islands is a good, clean, safe, and wholesome game for kids. The game play in Poptropica Forgotten Islands is also easy enough for the younger members of the family too. They can jump around the levels finding stuff. They can fly the blimp around the world map, and they can talk to the characters. 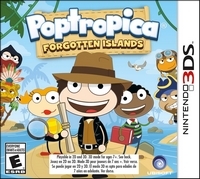 I had fun playing Poptropica Forgotten Islands on the Nintendo 3DS. Poptropica Forgotten Islands comes in an awesome, amazing, and always accepted physical copy. It is also in that download only option that is looked down upon in most circles. The controller input on the 3DS improves how this game plays. Poptropica Forgotten Islands has bright colors, and we do not damage other characters. There are spikes that will bounce us backwards. They are a mild nuisance at worst. It just teaches us to super jump more accurately next time. It is awesome how we help all these other characters in Poptropica Forgotten Islands. They need us to help them find items. Even when they are like five feet away from that character. Exclamation points appear on the screen when we need to go to the map screen. Characters will have an icon over them when we need to talk to them. Poptropica Forgotten Islands is very easy and intuitive to play.